The Weight Watchers points plus calculator on this page is a free online tool. You can use it to find the values in the foods you eat. Tracking the points can ensure you stay within your limits and reach your goals. The below tool is intended for those still following WW points plus system. If you are on the new plan, then use this SmartPoints calculator. If you are looking for the calculator for the original method, click here. Total Fat (g), Carbohdrates (g), Fiber (g) and Protein (g). If fiber information is not available, use zero. Input the required nutritional information in the calculator above. Then click "calculate" to find out the total Weight Watchers Points Plus values for that food item. Use the reset button to clear all fields. You can also just input the next item's nutrition information and click calculate again. Find out the calculation behind this points plus calculator by checking out this article. Here are more useful calculators, articles and tools for Weight Watchers members that are following the points plus system. You will also find some links for articles on the new Freestyle plan that you can read. Check them out and see if you are ready to make the switch. This free online tool will calculate how many points you earn for your workouts and activities. Just plug in your weight, how long your worked out and at what level. Be sure to pick the proper plan. 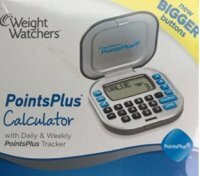 This is a points plus calculator for activity as well as an activity calculator for the original Weight Watchers plan. You may want to have an occasional social drink but are not sure what the points plus value is. Check out this article for a simple and easy way to find out the points in those drinks. The formula for these beverages uses alcohol and sugar alcohol to determine the points plus value. With the points plus system came a new way to calculate the daily allowance. Use this Weight Watchers Points calculator tool to get your daily allowance number. This calculation uses your gender, age, weight and height to give you the answer. This list is for the foods that are zero points on the plus plan. The list is shown by categories (i.e. condiments, dairy, etc.). The fruits and veggies are not listed as these are all free (with a few exceptions) on the points plus plan. Here is a list of many foods that are only one points plus value. These are great for adding to your meals, recipes or even snack ideas. These are also listed by categories making it easy to find what you are looking for. This free downloadable spreadsheet will track your points regardless of which system you use. Just plug in your numbers (daily and weekly allowance) and then start recording what you eat. The formula will adjust your points allowance as you record the items. If you are unsure if you want to make the switch to SmartPoints and start free styling your weight loss, then read this article to get an overview of the new plan. Find out what all the fuss is about on the new list of zero point foods. This article explains why, and why not, the foods made the cut. Find out the points plus values for the menu items at some of the most popular restaurants. Eat out knowing you can stay within your daily and weekly allowance. Get ready for summer by flattening your stomach. This fitness video series is all about abdominal crunches. Learning ways to control your hunger can help you reach your weight loss goals. Use these tips to curb your appetite.